Details about BELGIUM 1989 DUCKS BOOKLET PANE SG 2992a SET 4 MNH. 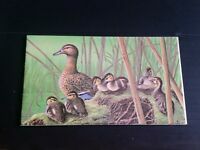 BELGIUM 1989 DUCKS BOOKLET PANE SG 2992a SET 4 MNH. BELGIUM 1994 FLOWERS BOOKLET PANE SG 3241a SET 4 MNH. BELGIUM 1993 CATS BOOKLET PANE SG 3184a SET 4 MNH. BELGIUM 1995 SAILING SHIPS BOOKLET PANE SG 3274a SET 4 MNH. BELGIUM 1991 PHILATELY FOR THE YOUNG COMIC STRIPS BOOKLET SG 3090a SET 4 MNH.